I left myself several days to recover. I didn’t think my fingers could type, as the aches and pains from my legs had travelled upwards to my knuckles, but I also knew that if there’s one thing Swaras aren’t famed for, it’s sitting back and waiting. Enough photos have been shared and anecdotes bandied about, for an official, non-partisan and purely factual narrative of the weekend’s antics to be necessary unfortunately, dear readers, that’s not what you’re going to get. Far from it. 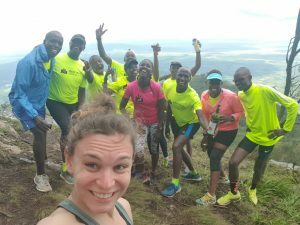 You’re going to get an amateur runner’s, accomplished wine-swiller’s, recently (sort of) Kenyan’s account of one heck of a weekend, with all the subjectivity and personal colour she can possibly muster. Weary travellers like ourselves trickled into Afrika Lodges over the course of the afternoon, happy to see familiar faces, and familiar white chalk arrows outside the entrance gates, a promise of what was to come. Credit to Wahome, our phenomenal host and barman, for providing the most comfortable of beds for naps, night-times and who knows what other shenanigans. But this is a family-friendly publication. 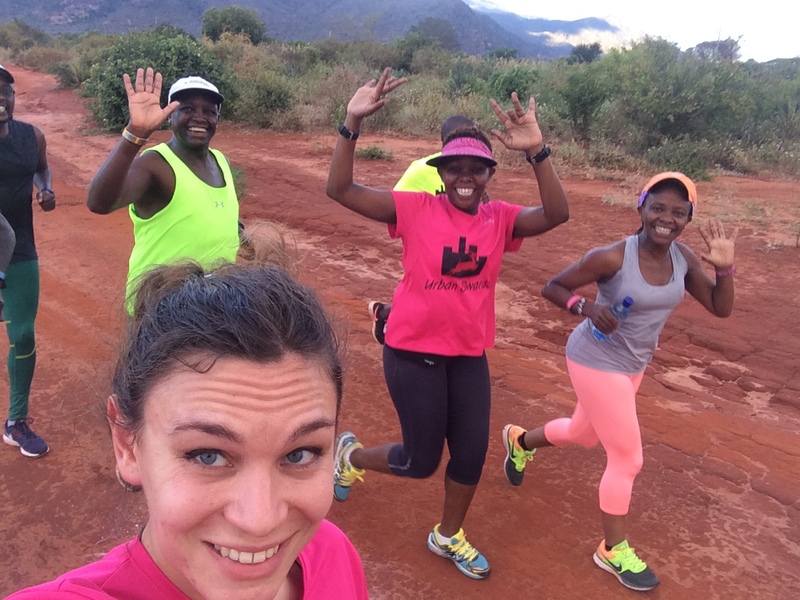 The first run, the ‘warm-up’ got pretty heated, in the late afternoon Taita Taveta sun, throwing up red dust over small ravines, through expansive fields of dusty green vegetation that perfectly reflected the dappling sun that was getting us nice and ‘warmed up’ as we eased into our 13km. Some Swaras, with names that may or may not rhyme with Pond and Saoul, barely broke a sweat, and warmed our seats back at the hotel bar once they were done. Our muscles looked at the hills in the distance with longing; little did we know what was in store for us the next day. First though, back at Afrika Lodges, there were of course refreshments aplenty, and Swaras got busy carbo-and caffeine-loading, swiftly followed by copious amounts of dinner and, to our delight, more carbs. I’m not ashamed to say I took some of my carbs in liquid form, which I assured everyone makes me run better, but only Cheruiyot (whose fault it is that I’m the scribe of this newsworthy adventure) joined me for something cold and slightly fizzy before everyone got a rather sensible early night. I would never claim that Chairman had anything that wasn’t water so let me end this first chapter here. I feel like I can allow myself to shake things up a bit. Fast forward to 24 hours later, all Swaras (except for a handful of die-hard runners who are also very good at running to the bar) were safely tucked up in those same beds, with the memories of their 20, 30, 35, or even 48km accomplishments cradling them to a deep, peaceful and well-earned sleep. But how did they get so tired, you might ask? Swaras are die-hard athletes who can tackle anything and go on to be productive, social human beings in the big wide (normal) world! It all began with an early morning wake-up call from Ferrah, who had sequestered Chairman’s whistle but couldn’t quite figure out how to use it. Luckily for me I was bunked next door to her so I got the full blast of her attempts as I was emerging from my dreams of marrying a prince and having my designer dress broadcast across the kingdom. 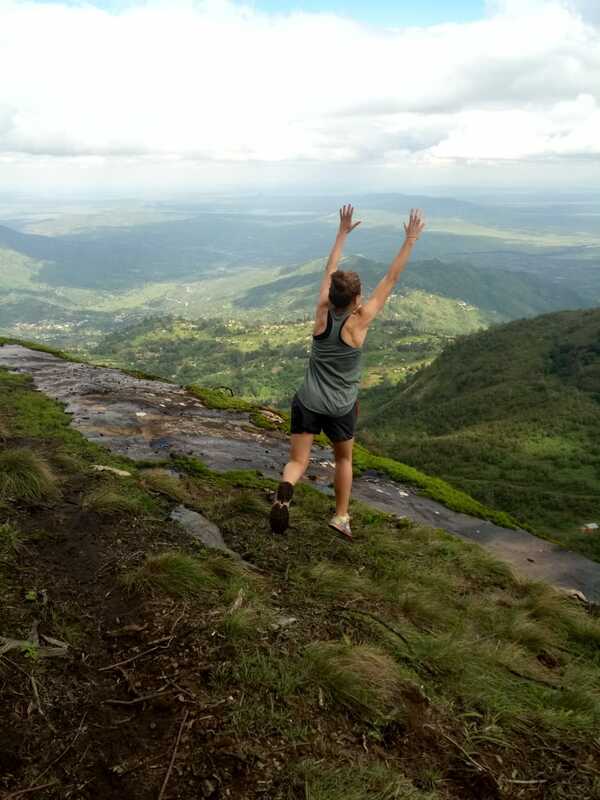 Then there was, you know, the Andean, Alpine, ten-times Mount Kenya-esque range of hills that we conquered, bottom to top, with varying degrees of intensity and speed, but always with confidence and panache, because that’s how we roll. A brief breakdown of how this run works: the dirt road starts when you take a turn off the tarmac a few kilometres outside of Voi town. From there, it’s 48km to the end of the road. As long as you carry on straight, you’re on the right track, and will be rewarded with views that will take any breath you have left in you completely away. For those who aren’t made of superhuman material, you can be dropped further along that same road, cutting your total running distance down to 40, 35, 30, 25, 20, or less. I was the only one doing the 35km, so I was able to sing to myself and skip and make all manner of noises and expressions as I went, with only the monkeys to judge me. I thought the 48km gang would never catch me up, but of course Benja and Otora broke that rule 7km in, and overtook me, uphill, in a leap and a bound. In fact, the 48m cohort was the biggest…at the start line. Let’s not talk about the end line until later. The air was balmy, with an early morning briskness about it, perfect for starting an uphill climb. The day warmed slightly as we got higher and our blood pumped a little more vigorously. Then I realised that Chairman wasn’t lying when he said the climb would only end at the end. The hills were relentless, twisting and turning through what felt like a hidden universe of villages nestled in between ranges and dips that even Safaricom network couldn’t reach. I wasn’t completely alone though. Because I have a fear of being alone, (psychoanalysis to come in a later write-up) I sped up to try and catch up some of the 25-ers, and came across a few, nice and sweaty and in spirits as high as the crest we were heading for. There was Chairman with Martha, and a steady-paced Rebecca; then I caught patron and his son as they approached an uphill climb. Of course, I had to pretend I could tackle that hill with ease, otherwise Patron would have seen me as a disappointment. Good thing he couldn’t see the writhes of pain on my face. Now, I’m the first to admit my errors. But taking a wrong turn is not a mistake. It’s a deliberate challenge to oneself. I found myself getting lost on the route that Otora had said was ‘so easy, you just follow it straight’. So I turned left. And cruised downhill for 4km before smelling a fish and hitching a ride back up on a boda, feeling ashamed but also proud of my extra 4km. Just 5km and approximately 300m of elevation later I was at the top. And, by gosh, it wasn’t half bad. We discovered a hidden viewpoint and a natural spring to wash the slick from our faces and the grit from our throats. Of course, many selfies were taken, then we dutifully headed back down to join the others and have our neatly packed picnic lunches. And this is where things started to go wrong. 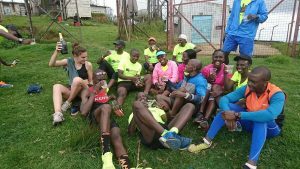 We met the Masika/Cheruiyot gang who had snaffled away all the beers we had ordered the night before for a celebratory post-run ‘cheers’. Yes, ALL of them. They were heading upstream, we were heading back for dry land, so we let them go. Then came Otora, with my champagne. 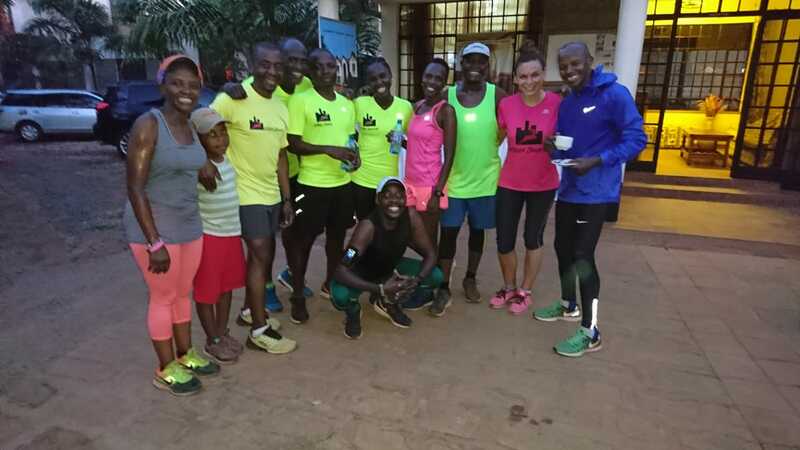 That’s an offer no lady can refuse, so back up we went, followed by James ‘barman’ Wahome, Raoul ‘birthday boy’ Kamadjeu and a motley crew of long-distance troopers. In fact, everyone followed us up the hill to finish the gruelling challenge in style. Let the party begin. Beer and bubbles flowed, as did the good times and the risk of falling 300m down the rockface with all the tomfoolery and danger-selfies we were attempting. Thomas Bond and Katara Wawa guarded the buses and lunches down below as we let 2600m of total elevation, five hours of blood, sweat and tears (of laughter) and body-loads of adrenaline wash over us in a cascade of unbounded joy and relief. Several naps were had on the bus back, but someone whose name may or may not rhyme with ‘Catia’ was calling for more beer at every shop we passed. And so, dear reader, you have a better picture of how 23 Swaras ended up exhausted, elated and fast asleep, several hours later, after yet more (recovery) carbs, a giant cake to celebrate Raoul-48-years-but-doesn’t-look-a-day-over-21-Kamadjeu’s birthday, and enough speeches to win an election. I guess we all knew we still had one more run to come. I’m not sure if it’s fair to call what I did the next day ‘running’. Sure, I transported myself from one spot, back to the same spot, with some movement in between, but it was by no means elegant or athletic. But at least it meant I didn’t completely fossilize ahead of the long drive back to Nairobi. Again, some people, whose names may or may not rhyme with Pond and Rara, don’t seem to be able to slow down. Maybe they thought we were chasing them, zombie-like and blood-hungry. I guess that’s just me before my morning coffee. For the journey back, Daisy, Marylyne and the children and I found a new chauffeur, none other than the one and only Joe Black, who we also pushed to his limits with bad karaoke (Whitney and Mariah even got an airing) and girls’ trip shenanigans all way down back to western Nairobi. 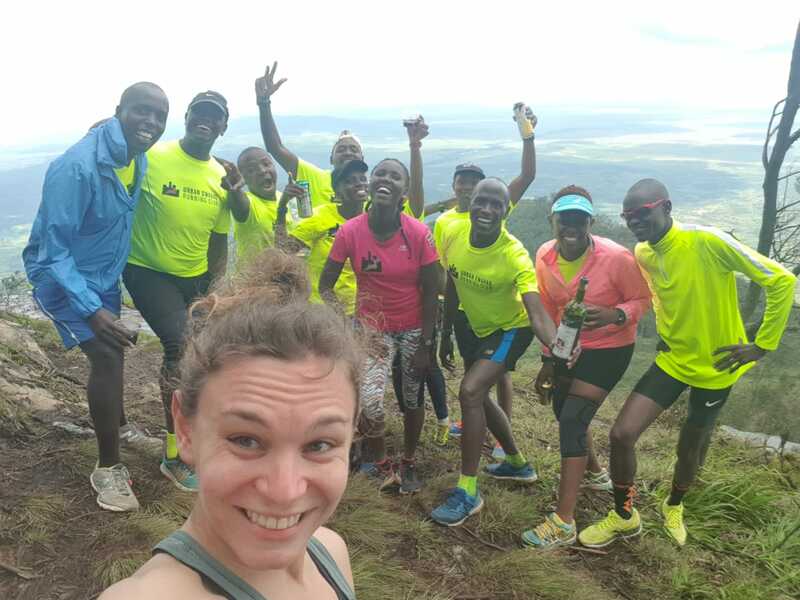 Whilst the aches and pains have now dissipated, the memories of this kaleidoscopic running extravaganza of a weekend are fading much more slowly, partly thanks to the deluge of Whatsapp images that have been inundating our smartphones since that day, and partly due to the fact that this running club, it has to be said, is one-of-a-kind. With Swaras, there’s no a-Voi-ding hills, and all attempt to give up are null and Voi-d.